Neil Young's Pono music player is finally going on sale. Available from Monday in 80 locations, including Fry's stores, it'll retail for $400. The big, bright triangular digital music player provides "studio master-quality digital music at the highest audio fidelity possible" according to PonoMusic, which gives listeners the ability to "experience music the way the artists intended." The music player has 128GB of memory and can "store from about 100 to 500 high-resolution digital-music albums," though you'll be able to expand that with a memory card. It also has both a touchscreen LCD and some physical buttons, too. As we've pointed out before, though, the player doesn't make a whole bunch of sense. The whole idea behind the player is to provide a home for "Pono" files with soaring resolutions, but there's no evidence to suggest that the HD audio files are audibly any different to the sound provided by CDs. But the files are bigger. And, uh, very expensive. 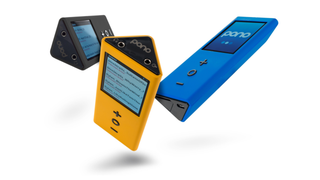 Indeed, the Pono music store has already launched, and it's predictably expensive. The store offers tracks recorded in 24 bits and 192 kHz, compared to a CD at 16 bits and 44.1 kHz. But the latest album from Jack White, as an example, will cost $24.99, while iTunes sells it for $10.99.